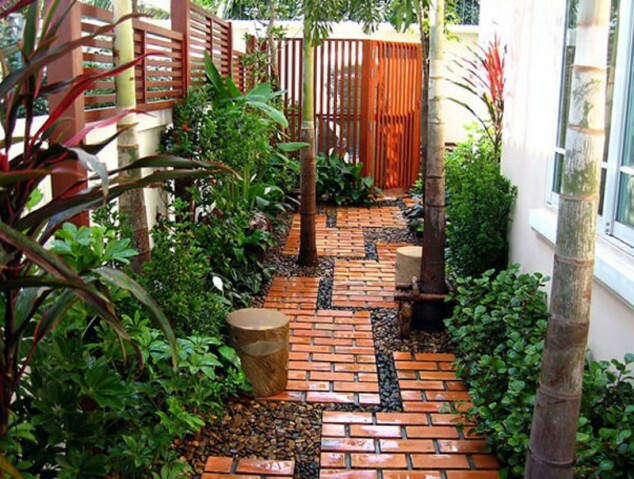 Would you like to have a garden pathway that will be the most amazing in the neighborhood? We have created the ultimate selection for you! A garden is not the same without a beautifully arranged pathway. It can be so impressive that your guests will be thrilled and will start asking how you did it. Fortunately, you have a lot of options and designs to choose from. 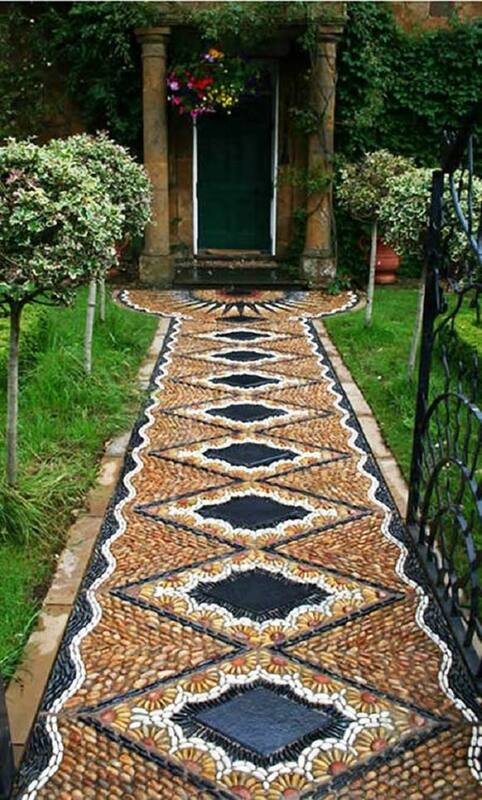 You can use pebbles, mosaic, massive stones, wood, or other materials. You can even use some materials that you aren’t aware can be used for the task, such as old tires. I know everyone wants to have the best garden with flowers, lighting, pathways, and even some extraordinary additions and I encourage you to start with an easy project and then move to the next level. It is not that hard. If you are handy enough, you can create a real masterpiece. 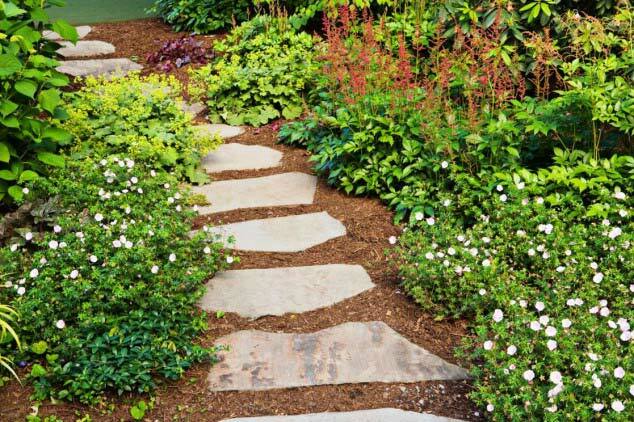 There are a lot of DIY projects on gardening and especially garden pathways here so check them out. This one is simple yet stylish and appealing. 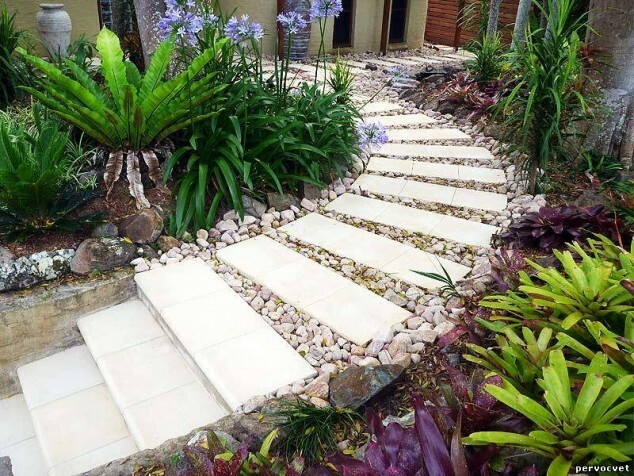 The garden pathway has three key elements – white gravel, border bricks, and large stepping stones. As you can see, the real beauty of this walkway is in the contrast between the elements. Consider the base below the gravel, it should be well leveled. It’s amazing how with so simple materials you can achieve a truly gorgeous look! 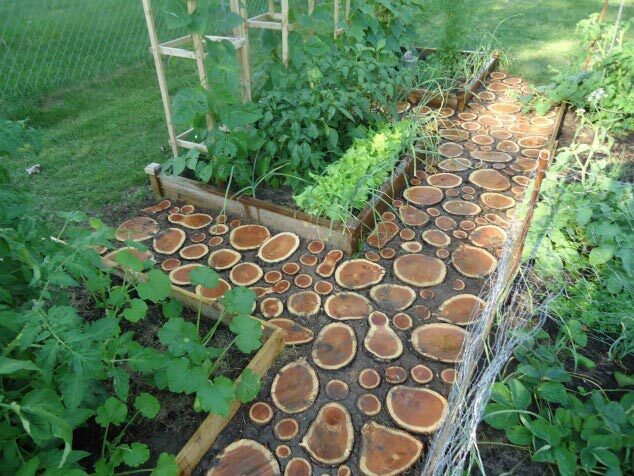 Creative, visually interesting, and eco-friendly pathway option. An easy and affordable DIY project, especially if you have plenty of empty glass bottles. You have to put the bottles with their top down deep into the ground, level, and support them. I’m not sure if this gets slippery after rain…However, it offers another way to reuse glass bottles. If you really like round shapes, this one is for you. This pathway of concrete blocks is an easy and affordable way to lend any outdoor space a modern look. You can fill in the gaps with soil, gravel, or mulch, the choice is yours. Actually, the charm of this pathway is in the perfectly round shape of the blocks. 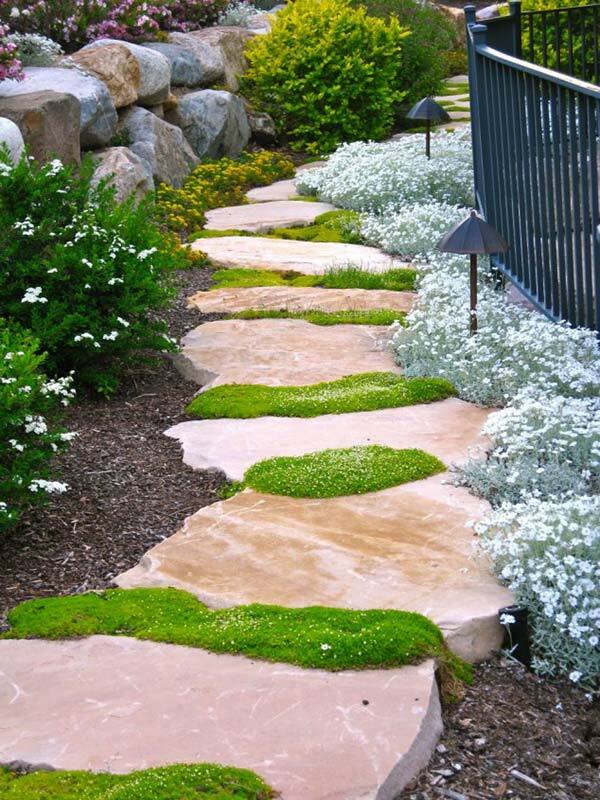 The combo of irregular stepping stones and gravel makes an appealing pathway. 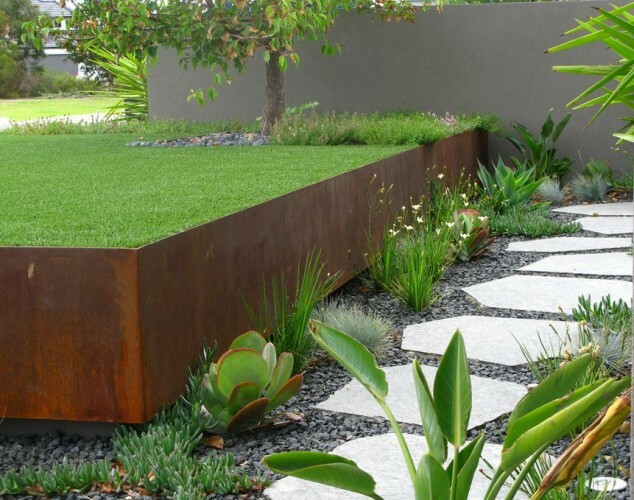 Raised metal beds with rust patina add to the modern look of the space. A variety of plants around the stepping stones adds extra color, height, texture, and visual interest. This spot is so green, fresh, and nicely looking! Nothing special here, but easy to DIY. 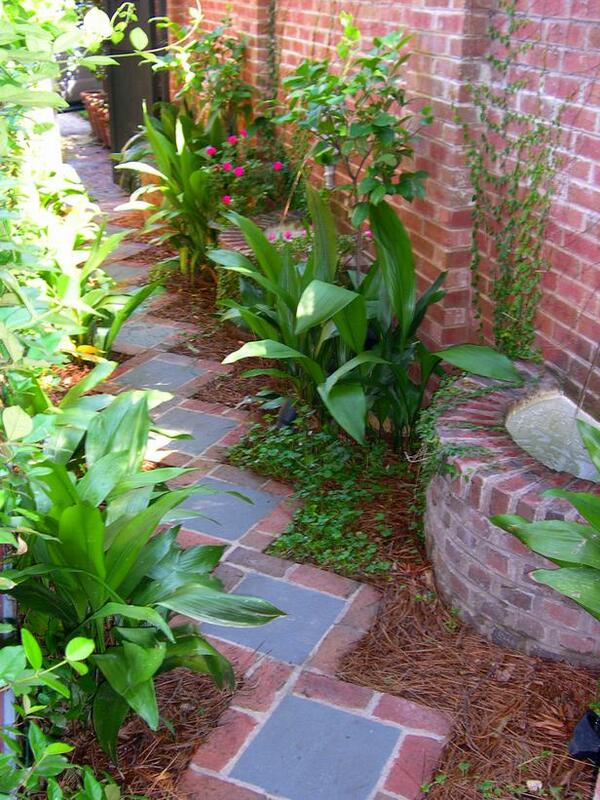 A combination of red bricks and tiles, this pathway lends the space a clean, organized look. Plus, it is well incorporated into the other outdoor items – the fence and the row of fountains. All these brick decor elements create a sense of harmony and emphasize the beauty of the crawling and standing plants. 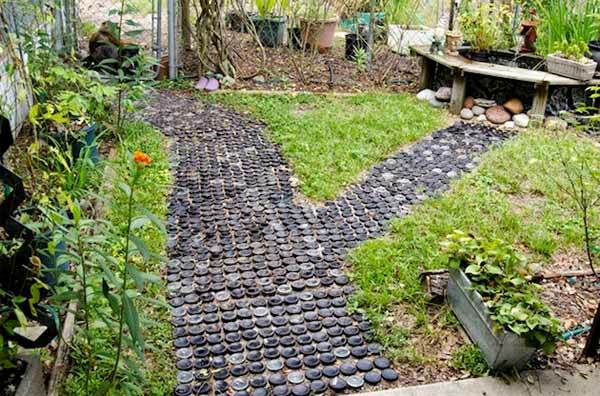 If you have some old tires and wonder what to do with them, here is an idea: create an eye-grabbing path. 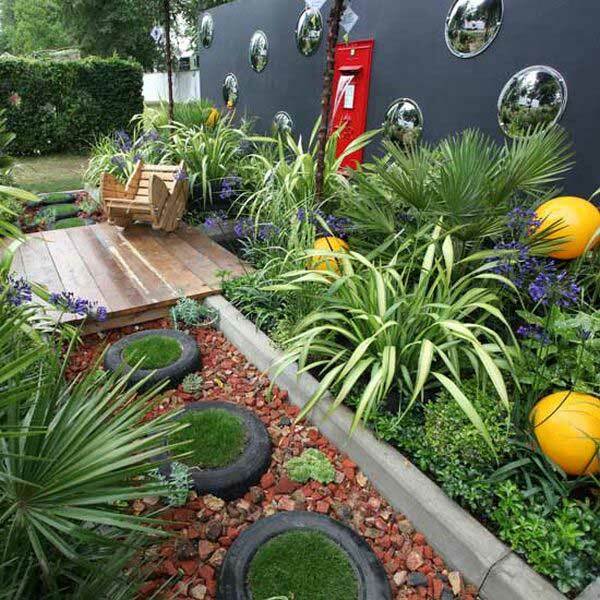 You can go a step further and plant some grass inside of each tire to add extra visual interest and appeal. Definitely impressive! Plus, it is a creative way to go green and reuse old tires! 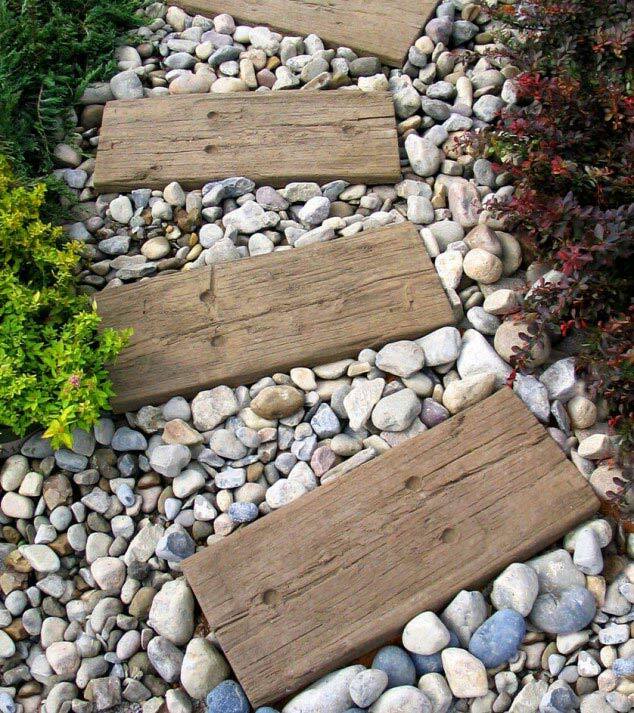 Use reclaimed wood steps and surround them with stones. It is a piece of cake, don’t you think? Yet, it is a charming, functional pathway that adds texture to the outdoor space and lets the greenery edgings stand out. 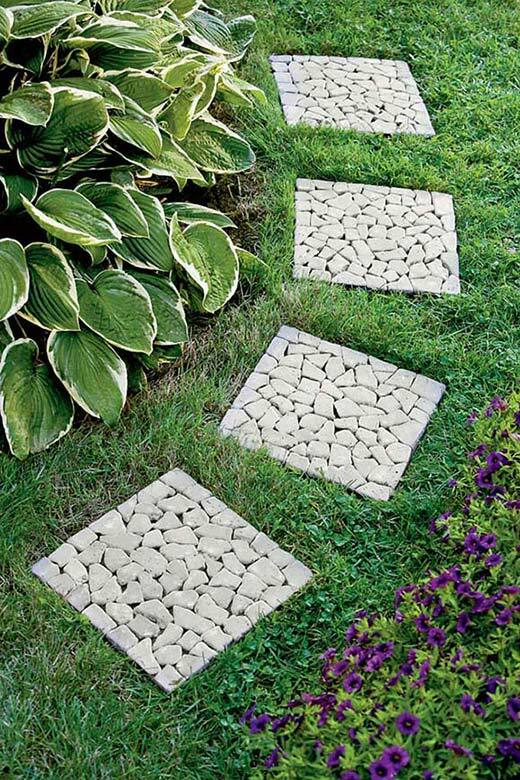 You can either find some tiles with a similar decoration or glue small stone pieces to some base to create these eye-grabbing square stepping stones. If you choose the second option, you have to be crafted and patient. Definitely an amazing, organic look! Bricks and pebbles do make a stunning combo! This pathway matches the color of the fence and nicely complements the greenery. Give it a try because it can lend your outdoor space a charming, clean, well-organized look. 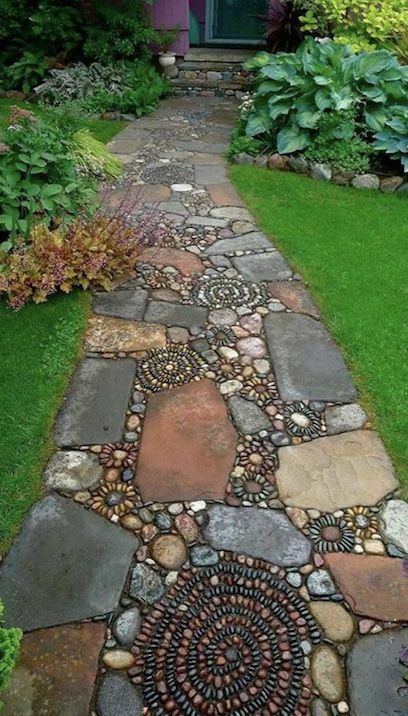 This pathway goes far beyond pure functionality, it is definitely a statement piece of garden decor! A fascinating combo of color, form, and texture, it offers a surefire way to lend a fairytale look and add tons of charm and personality to any outdoor space! Unleash your creativity! Position some stepping stones of different shape and color for extra visual interest and then fill in the gaps with some mosaic decorations. The more out of symmetry the better. Looks so organic! What a gorgeous way to add color and texture to any outdoor space! 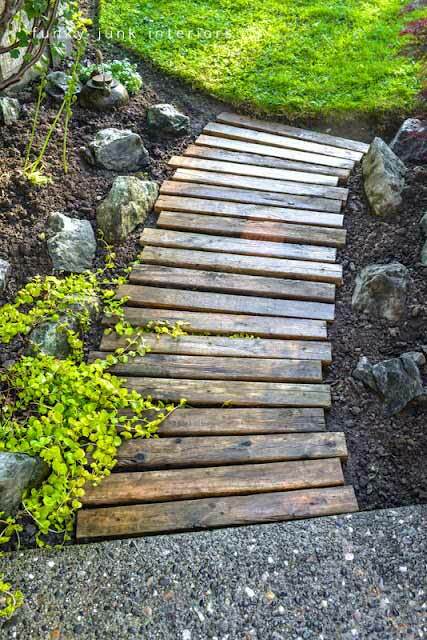 If you need a transition between two spaces in your garden, just put some wood and create a simple yet functional pathway. Use reclaimed pallet wood and just align the pieces. Easy…Affordable…Fabulous! White tiles stuck together to create a wide pathway, which nicely contrasts the greenery. Small pebbles are used as a base. This curved pathway creates a sense of motion and lends a fresh, modern look to the stunning outdoor space. This is not something extraordinary, but it has its charm. 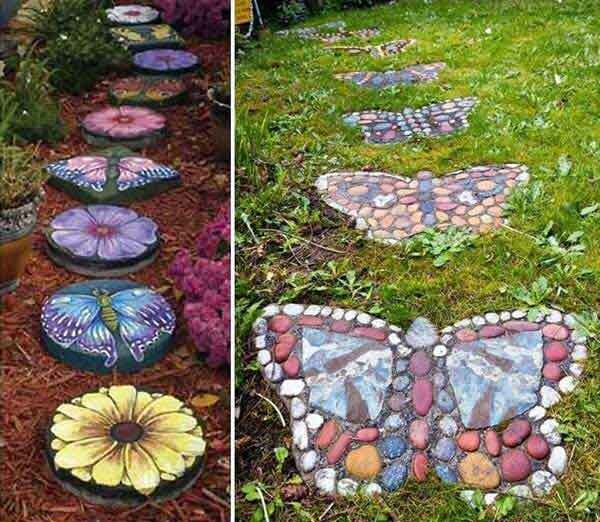 Why walk in the dirt when you can add some stepping stones? 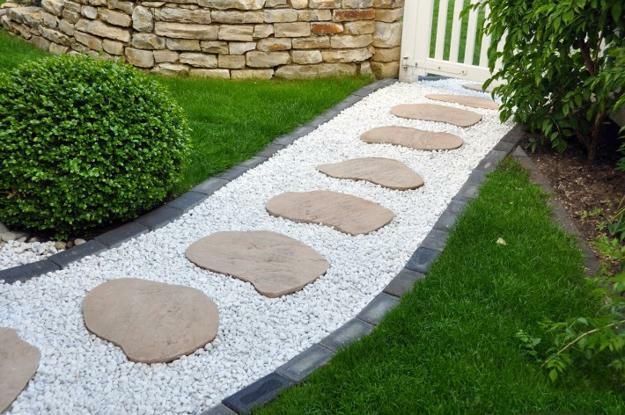 Arrange them as per your desire and voilà – you have a simple yet functional garden pathway! This one is my favorite. Grass and flower edges soften the look of the stone. 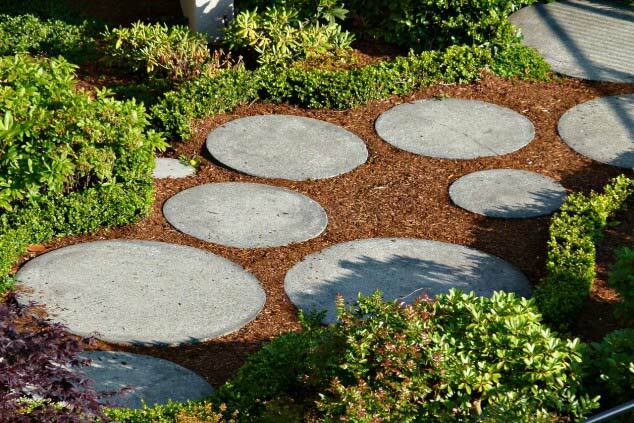 The fresh green color and massive stepping stones create something special in this garden. I hope you really enjoy this one. I’m not really sure if these are real tree logs, but it looks great. Looks natural and inviting. Makes you feel like you are in the woods. Vegetable and herbs raised beds add to the functionality and appeal of this adorable garden spot. The most amazing and fabulous garden pathway I’ve ever seen. I don’t know who have created it, but I can just admire this one. It is so colorful and charming! Definitely a statement garden element! What a way to add personality to any outdoor space!